I’d booked the tickets online for Les’ birthday. We’d both been really looking forward to seeing these incredible pieces of Chinese history. The Terracotta Warriors are on show in the World Museum on William Brown Street in the city centre. The exhibition kicked off in February 2018 and will run until the end of October. Adult tickets are £14 each. Demand has been so high that a large swathe of dates were fully sold out. The Terracotta Warriors, or Terracotta Army, were first discovered in 1974. Local farmers were digging a water well near the tomb of the First Emperor in the province of Xi’an. During the process, they inadvertently located one of the most magical underground tombs in the world. Although there had long been reports of terracotta fragments in the area around the tomb, nothing more was made of it. It wasn’t until the farmer’s discovery that experts were dispatched to the site and uncovered an underground world of caves and ditches filled with long-buried treasures. Although the Xi’an site is nowhere near fully excavated and there’s no telling how much more there is to discover, the existing army and associated artefacts caused a major stir around the world. Some of the life-size figures have previously been on display in London, Philadelphia, Barcelona and Chile, but it’s now Liverpool’s turn to play host. 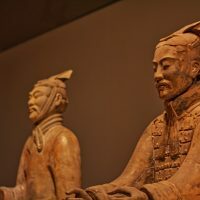 This is the first time the Terracotta Warriors have been on British soil for more than a decade, and the first time they’ve been out of the capital. As soon as you enter the ticketed area, you’re shown a short video on the history of the terracotta warriors. Once this is done, you can make your way to the start of the exhibition. The first thing you’ll see is a full-size warrior and his terracotta horse. This gives you just a flavour of what’s to come when you venture deeper inside. There are numerous artefacts around the show. There’s also a detailed timeline of Chinese history to guide you through the various dynasties that have ruled over the now Republic. It gives you a great insight into Chinese culture and complex beliefs that cement their traditions and life. The pottery, jade shoe soles, golden horses, jewellery and other treasures show off a rich history of China through the ages. Queues back up at the midway point of the exhibition and you’ll soon realise why. This is your indication that you’re closing in on the terracotta warriors. There are 6 warriors in a line; each from a different army and each depicting a different role. These include a soldier, an archer a charioteer, armed infantryman and a General. Each one is mind-blowing in its own right. Although they have no colour after being buried for 2,000 years, the detail and quality is nothing short of remarkable. Les and I kept looking at each other with open jaws as we walked through the darkened, temperature controlled rooms. It’s no exaggeration to say that a lot of visitors were pretty awestruck. Have you visited the terracotta warriors exhibition in Liverpool yet?